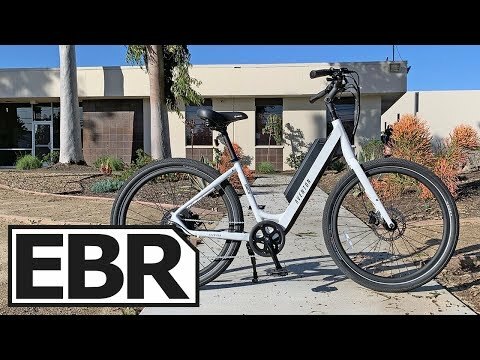 https://electricbikereview.com/ The Aventon Pace 500 is a price competitive and affordable ($1,399) yet powerful and versatile high speed ebike which aims to give more bang for your buck versus other value priced offerings. The Pace 500 features a capable electric drivetrain sporting a 20mph trigger throttle and a 28mph cadence based pedal assist, each complimented well by the stopping power of hydraulic disc brakes. A overall comfortable ride with relaxed ergonomics and thoughtful finishing touches like reflective sidewall tick tires, also comes in a variety of size and color options for both frames. To keep the price low, some tradeoffs are to be considered, no suspension, no intergraded lights, no USB charging, but the big one to keep in mind is the assembly you may have to do on your own, however, you can always get some help from a bike shop, mobile service, or use their instructional videos.